The sun was warm on our heads and cool fresh mountain air filled our lungs as the trees rushed by us. The whine of the engines drowned out all thoughts of bills, schedules, and responsibilities. This is nature therapy! We had a destination in mind when we set out that morning for a ride on the quads. The day was perfect for a ride. It is early in the season. The river is high. The runoff has created beautiful waterfalls. It’s not yet too dusty. But…..the Forest Service hasn’t been able to clear all the ATV trails and the roads yet. We headed off in the direction of our destination. We took time to make stops and take pictures of the beauty that surrounded us. At one point we came to a fork in the road. We chose a road that seemed right and followed it. After a while, we realized we had taken the wrong road. We got out the map and determined we could still get where we were going on this road. It was just going to be the scenic route! We decided to press on. There seemed to be an awful lot of obstacles on this route. Snow, washed out areas and many downed trees across the road. Some we were able to move, others we could drive over or around. A couple of places it was a bit sketchy getting around and over the trees being so close to the edge of the road and being so high on the mountain. My middle daughter, Christi, is an amazing rider. She really is. Granddaughter Brooklyn rides on the back like a champ! Sometimes she gets scared though. Those obstructions and the way around them was a bit hairy and Brooklyn was NOT a fan. We went around the first downed tree ahead of our girls and my husband looked back at Christi. She looked at the tree and the cliff, then she looked at Brooklyn and looked at her Dad. Brooklyn was already trying to get off the quad. Christi got off and held her hand. Chris walked back and drove her quad over the tree on the edge and to a safe place because that is what good Dads and Papas do! After a few of those, we came to a giant tree across the road. There was no getting around, over or under. We were done. We had to turn and go back. No big deal, we weren’t on any time schedule. We were enjoying the ride. We got back to the place where we had made a wrong turn and chose the other road. Pretty soon we came upon a truck stopped in the road. As we began to maneuver around the truck we saw there was a man cutting a big downed tree across the road that we would not have been able to cross. We waved at this nice man who was making it possible to continue our adventure. He turned from his chainsaw to wave back and we realized it was an old friend! Now, what are the chances of running into someone you haven’t seen in several years, on the top of a mountain on a random forest service road?! Slim, I tell ya! We stopped and chatted and helped him load his firewood, our obstacle, into his truck. We thanked him for clearing the road and exchanged hugs and handshakes and went on our way! We did eventually reach our goal and had a picnic before heading back. Lauren, my oldest, mentioned how even though we had many challenges along the way, it did make our trek more interesting. More interesting, in fact, than our picnic. On our return trip, I had time to ponder that. Our lives are so much like that expedition. We are going along and think we know our way but sometimes make wrong choices. We think we can power through and make our choices work anyway. We reach scary places and God is always right there to help us if we ask. He will gently tell us we are going the wrong way by one downed tree in our path after another. Perhaps those snags are there so we can learn how to best get past them so we can teach someone else, or maybe it just makes a really great story! Sometimes, it takes a giant tree in the road to get us to turn around if we are headed in the wrong direction. We might think “Why am I being prevented from reaching my goals?”, when in fact it is God’s hand directing our path. He puts people in our lives to help us. It may be a friend, or family or a stranger. Sometimes those people don’t even know they are doing God’s work. God has a plan for each of us. The bumps in the road make life interesting. Ask God for help when you are overwhelmed. Look for His direction. Be aware of the people in your life. Enjoy this journey! If you haven’t had Tacos while camping, well, you should! Everything seems to taste way better in the woods anyway, but this weekend we had tacos in the great outdoors and it was glorious! I don’t know why I had never thought of it before. I know that isn’t one of those things you think of as “camping food”, but really it is pretty easy to do with limited equipment. Everything can be prepped ahead of time and if you are tent camping just leave out the lettuce. Tomatoes don’t need to be refrigerated if you leave them whole. I am not a huge “brand” person most the time, but right here I am going to be that lady. McCormick Taco Seasoning all the way and either Cholula hot sauce (you know, the one with the little round wooden top) or Taco Bell’s Hot Sauce that, yes, they do sell in stores!! S&W Organic Black Beans are amazing! Click on those links to order! You won’t regret it! Those ingredients just make tacos for me! Click here to get the program I use for all my recipes and menu planning! Here is my taco meat recipe. I hope you enjoy it no matter where you are! Saute ground beef, onion and garlic together. Drain fat from pan. Add black beans, taco seasoning, and water. Stir, bring to a simmer for about 5 minutes, stirring occasionally. Taste for seasoning adding salt and pepper if necessary. 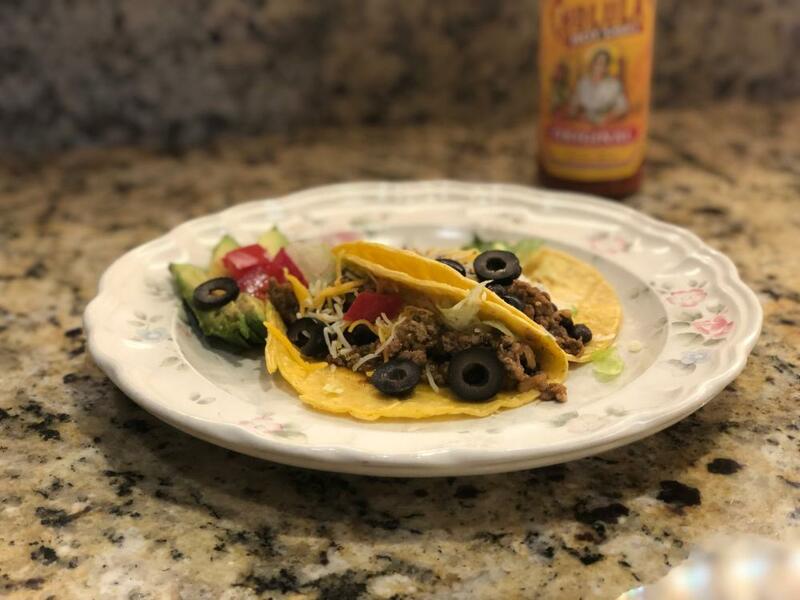 Serve in taco shells, flour tortilla, corn tortillas or lettuce wraps with lettuce, tomato, sliced olives, shredded cheese, sour cream and hot sauce.